Have your next project be controlled by your muscles with the MyoWare Muscle Sensor! 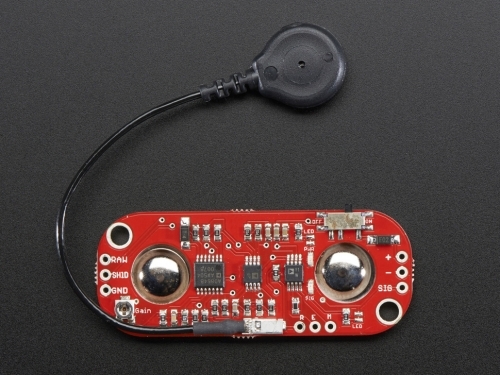 Pair the MyoWare with some Muscle Sensor Surface EMG Electrodes and a microcontroller (ie. Raspberry Pi, Arduino, or Beagle Bone Black) to create a DIY low-cost version of an EMG or an electromyograph! Use these sensors in prosthetics, robotics, and so much more! Once you attach the sensor to a large muscle (like your bicep) you can flex and measure the signal spike as an analog voltage. 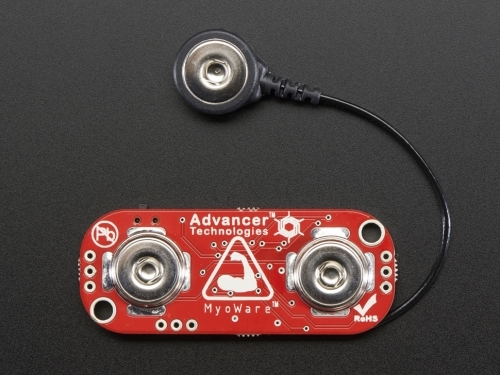 These MyoWare Muscle Sensors are designed to be used by hobbyists, backyard tinkerers, and students alike. Check the datasheet for more information and both setup configurations as well as setup instructions. Note: Electrodes and Arduino (or other analog-reading microcontroller) not included, you'll need both to get readings out of the Myoware!